Gathering Wisdom: What is the Dantian? There are three Dantians (dan tiens). The Lower Dantien is the one referred to as your "Center' and is where chi is accumulated and stored. All movement originates and is directed from here. Enjoy! There are numerous references to the dantian in T’ai Chi Ch’uan practice, as well as in other martial arts and in Chinese methods of meditation and self-cultivation. In Japanese practices, it is referred to as the hara. 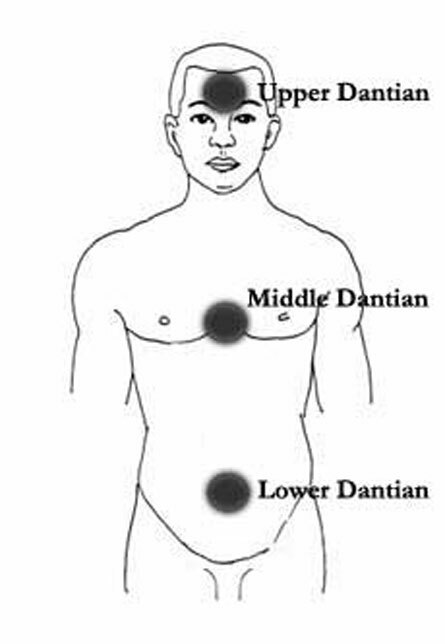 The word dantian, also written as tan t’ien, usually refers to the general area in the lower abdomen, beneath the navel and about one-third of the way in the abdominal cavity. It is sometimes associated with the acupuncture point Guanyuan, Origin Pass, conception vessel 4. The dantian is also sometimes associated with conception vessel 6, qi hai, sea of qi or ocean of breath. The word dantian translates as cinnabar fields, or elixir field. Alchemists in ancient China, as in the West, were interested in transmuting base metals into gold. Others were interested in transforming the base materials of life into a golden elixir for immortality or long life. Others sought higher stages of illumination or to create a soul. Another use is to transmute the qi in the dantian into spirit, or shen. For the average practitioner, it involves improving health and reinvigorating internal organs. Sometimes massaging the dantian helps to stabilize one’s emotions or to improve internal organ function. A famous Japanese healer diagnoses diseases using the patient’s dantian. Since the dantian is so fundamental to the culture, there are many uses and locations described. There are three primary dantian. One is in the abdomen, one in the heart, area and the upper one in the location of the third eye, or brain. 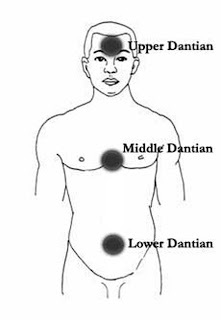 Sometimes one of the dantians is described as being at the top of the head, at the Bahui acupuncture point, a second at the navel, and a third at the Huiyin acupuncture point at the bottom of the torso between the legs. The dantian at the navel, or in the lower abdomen, is sometimes described as including the important mingmen area at the back, between the kidneys, roughly opposite the navel. The dantian in the lower abdomen is said to be the residence of primordial qi, or the yuan qi, the energy that each person receives from their parents. This inheritance is the foundation of life, and as one matures, it is consumed as people use it in daily life. People learn to get other energy from food, air, and their environment for daily life. T’ai Chi Ch’uan and meditation are said to be two methods of replenishing this original qi. During daily life, energy from the dantian is drawn upward and used by intellectual activity. If properly used, some of the energy re-circulates throughout the body, returning to the abdomen. Too often it remains in the head, causing distress or disease. Often, when people get emotionally upset, it can mean that their qi has risen to their emotional or mental centers, where it stagnates. In T’ai Chi Ch’uan and meditation, one tries to "sink" the qi, or energy, into the lower abdomen. Of course, one cannot sink all of the qi. The idea is to help recirculate the qi through the dantian. For most beginners, there is no specific feeling in the dantian and no feeling of energy there. So, it is hard for them to comprehend. The practitioner may be told to put their mind in their lower abdomen. This also is not that easy to do for a beginner, or even an advanced practitioner. But it is easy to say. It sometimes helps to be aware of the abdominal wall moving out and in as you breathe. This awareness helps to give a focus point. But don’t make a judgement whether it is too little or too much.There are many ways to work with the dantian, including rotating it and coordinating the rotation with movements as practiced in the Chen style. There are many variations on this.Most styles just let the energy sink to the dantian. Then the movements will naturally activate and massage the dantian. The important thing is not to try to force the energy or the mind. The first principle is relaxed awareness. Even awareness of one’s own body will help to release qi and let it gently return to the lower abdomen. Over time, one may experience some fullness or heat in the lower abdomen, but this is not a measure of success or failure. With reasonably good practice over time, qi will accumulate in the dantian. The abdomen should always be kept relaxed, but as qi accumulates from daily practice, it does become "strong," like a drum during movement. This condition may exist even in a relaxed state. But it is self-defeating to try to create this artificially by force or try to make it become strong. Keep in mind that teachers are often limited in what they can say about this and other complex practices because they are often talking to beginners and people they do not know well. So, they can only speak in the simplest terms lest the students try too hard, do the wrong thing, and injure themselves because they are inexperienced. So, the beginner should listen with this in mind and continue practice with common sense. Later, they can ask for clarification based on their experience. Like all internal practices, this is not a procedure where day by day you get better and better in a linear fashion. It is an organic process with delays and errors and gradual development. Your development depends on your own abilities and efforts, like everything else. You cannot expect a teacher to always want to or be able to tell you what to do next in this process, since you are dealing with yourself in a global perspective. Thanks so much for stopping by, lots of good info here! this is helpful info...thank you! Thank you for your beautiful and very interesting blog Celina, and, thank you for coming by here to visit my Path with Heart. Your kind words make my modest effort here infinitely worthwhile. Please come again and feel free to share your thoughts, feelings, and Wisdom anytime. Thank you too, Anonymous, for coming by to visit. Please feel free to use your name so we may get to know each other. I am sure you have a lot of Wisdom to add to my Path too. We are all here to help each other with love and compassion to get back in touch with the Peace, Love, and Joy of our True Nature. Thanks for the informations.Is it that the lower dantien is something like a chakra (manipuraka...from where all the pranic channels originate and directed to all the parts of the body?yogic science...is it the seat of emotions?kindly make me understand.can chanting Aum etc etc make this dantien powerful? Hello my dear friend! You have been on my mind a lot for quite some time now. I sincerely pray that you are well and have learned to be mindful doing(not-doing) the physically-demanding work you do every day. Indeed, Nirmala, the three Dantiens are chakras. The lower Dantien is the "Elixir of Life" and is where the chi is accumulated with proper Practice. This is our "Center" that I speak of throughout this blog. Allow your mind to relax, your Awareness to reside in the powerful Silence here as One with your Intuition, and Be One with the God within - your True Nature.